Leek and chickpea soup with chilli oil. 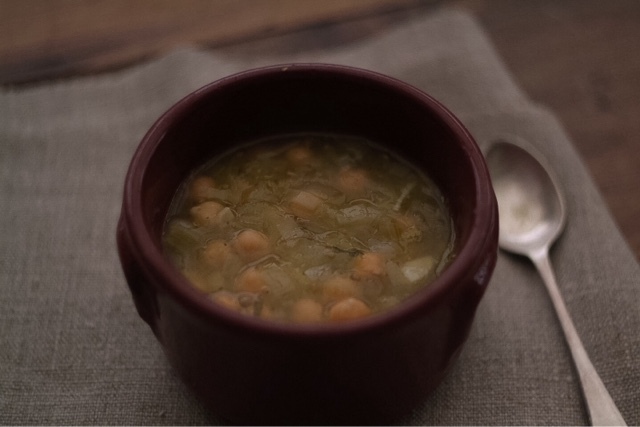 This leek and chickpea soup is so simple and satisfying, and the chilli oil takes it to another level! Start by making the chilli oil, add the oil, chopped chillies, garlic and thyme to a small pan, and heat very gently for 10 minutes, then set to one side and let it carry on infusing. (This will also keep in an air tight bottle for a few months). When your ready to use, strain through a sieve to remove the bits. For the soup, finely chop the leeks and celery and add to a large pan with the oil and butter, bay leaf and thyme, sweat on a low heat for about 15 minutes until lovely and soft, then add the finely chopped garlic and stir through followed by the chickpeas, then add the vegetable stock. Bring the soup to the boil then turn down to simmer for 20 minutes, season to taste. Leave to cool slightly so the flavours are well married together. Pour into bowls, drizzle with chilli oil and carve a chunk of really lovely bread. Eats really well accompanied with a mug of tea!